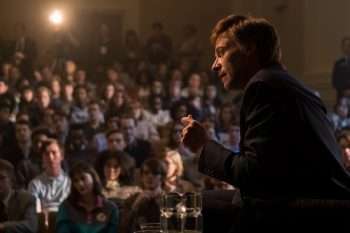 On the heels of last year’s successful musical The Greatest Showman, Hugh Jackman amps up the drama with the highly anticipated feature The Front Runner. Directed by Oscar nominated filmmaker Jason Reitman (Up In The Air), the feature centers on Senator Gary Hart’s (Jackman) once promising run for the 1988 Democratic presidential nomination. The politician’s affair with Donna Rice (Sara Paxton), as well as the tabloid journalism that hounded Hart, eventually led him to withdraw from the race. Vera Farmiga co-stars as in the film as Hart’s wife, and the rounding out the ensemble are Oscar winner J.K. Simmons (Whiplash) and Alfred Molina. The picture is based on Matt Bai’s book All the Truth Is Out. Jackman looks convincing as Hart in the trailer, which puts Nina Simone’s “Sinnerman” to ample use. The Front Runner opens in select cities November 7.